A siamang is not a monkey, but rather a gibbon—a so-called lesser ape, which like a Great Ape (a gorilla, chimpanzee, orangutan, or bonobo) lacks a tail, moves in a somewhat upright posture, and boasts a brain that’s more developed than a monkey’s. 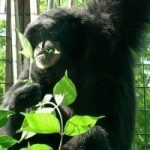 The siamang, which has black fur and is native to the forests of Malaysia, Sumatra, and Thailand, is the largest of the 13 gibbon species: in the wild, they may grow to more than 3 feet and weigh as much as 30 pounds. A siamang is also distinguished by two physical characteristics: two toes on each foot are partially fused together, and a balloon-like throat sac, which inflates to the size of the animal’s head, is used to make loud, whooping calls that bellow throughout the forest. Siamangs are also distinguished by their arm-over-arm locomotion, called brachiation, which allows them to swing like long-limbed trapeze artists from one branch to the next. Jenny is one of our senior residents who was captured from the wild in 1971, and spent the majority of her life in the Greater Baton Rouge Zoo in Louisiana.